This project was created on 04/30/2016 and last updated 2 years ago. I try log all the steps, data, informations, hacks and finds about this unit I just received, which is subtly different from the more common FE-5680A, but as capable. Thanks for the feature at http://hackaday.com/2016/05/04/a-rubidium-reference-for-discrete-component-clocks/ ! I have found many useful resources on the &apos;net but this particular model has interesting resources scattered around websites. Furthermore, my experiments found other useful signals. 3. Where to get some interesting frequencies ? Andre Lubbock hacks his FE-5680B. I&apos;ve left it alone after the lock, to write the previous log and then returned to the workshop where a smell of burned resistor worried me. The current was bumped to 2.6A, 2A more than normal. I don&apos;t know how long it took (10 minutes ? I&apos;ll have to measure next time) but the "lock" output has finally been asserted. Parameters: Ta=18°C, 15V, 0.60A when settled. The unit rests on bubble wrap to insulate against heat losses through conduction with the table, yet the other side is exposed to free air to prevent overheating. The question of insulation vs heatsinking is pretty complex but a mixed approach should work. Too much heatsinking and the unit will draw too much current to heat the Rb lamp to >100°C and locking might take a very long time, if ever. I measured again : from a cold start, the block took 13 minutes to lock while the current was 0.7A (not yet settled to 0.6A). This is pretty long and it could be a sign of old age (or a cold room), but this is not critical for my occasional needs. Maybe I&apos;ll have to get it recalibrated, or buy a second one... one day. Where to get some interesting frequencies ? The seller&apos;s description of this object is "FEI fe-5680b rubidium oscillator With 1pps 20mhz output ONLY/10mhz NEED to MOD" and it includes pictures showing the PCB. The "NEED to MOD" part makes it clear that the box must be opened. The 1pps signal should be directly available on pin 5 of the HD15 connector. The only catch is that it only appears when the clock is locked. Some more practical considerations are provided in "I can&apos;t see the 1pps output!". 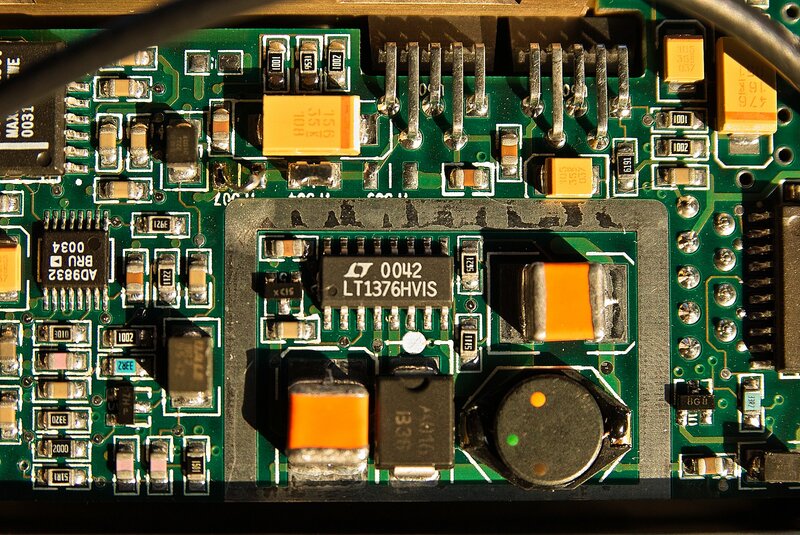 The advertised 20MHz is explained by the seller : find it on the PCB and solder a wire. So far, so good and I&apos;ve found the 20MHz as expected. Now, somewhere (I&apos;ll probably remember the link one day) I found the schematic (somewhat reverse-engineered) of the model A. This is not model B but some similarities are striking. In particular there is the same Xilinx CPLD with those interesting signals: The CPL gets 60MHz and outputs 30MHz, 20MHz, 10MHz and 1pps. Several attempts have been made to dump the CPLD&apos;s configuration but that&apos;s not really interesting, as the lower-left corner shows the interesting part: this is the 60MHZ input (coming from the clock generator). Is this valid for my model B? The probe peeked at that pin and found the expected high frequency signal. Looking around, I found that this signal is available on a testing point (just like the previous 20MHz), so there is no need to hack the other side of the PCB ! I also notice something else : this signal appears to be coming from the collector/drain of a transistor, so it might be already amplified and this would reduce interference with the clocking subsystem. The FE-5680 family has so many variants ! 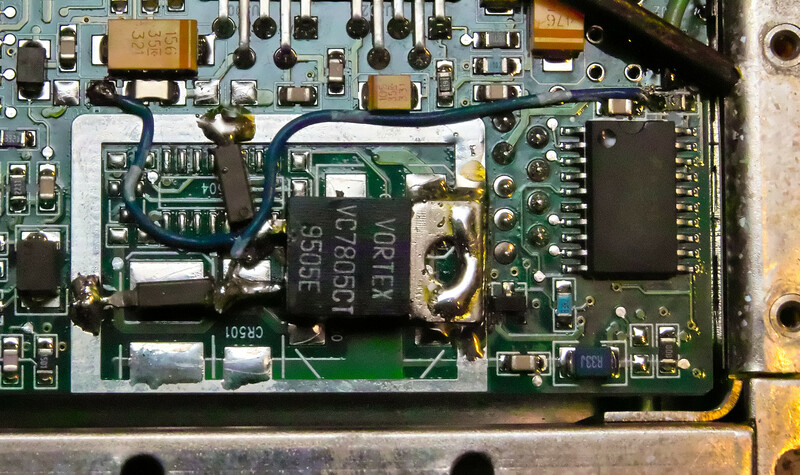 Some need an external 5V power supply, others generate it internally. The external supply makes sense to save a buck or two on a buck (pun) converter and its parts. The other solution is good to keep the modules count down. So the parts of the converter may or may not be soldered. This is illustrated on figure 4 of http://www.ka7oei.com/10_MHz_Rubidium_FE-5680A.html where one unit has no parts (and gets a replacement) and the other is populated. I don&apos;t have this model, the connector and the PCB are different. I forgot where I found this picture. I had a vague souvenir that there was a pad to short near the edge. I wired a 100K resistor to the &apos;scope&apos;s probe test point (2Vpp square) and hooked the signal to the HD15 pin. Simultaneously I probed the pads that I thought would be the best candidates. Examination of the PCB near the HD15 pins shows that there is at least a filtering capacitor (and even probably a Pi C-L-C network). So of course the signal would be distorted but the frequency is low enough to pass and appear as some sort of sawtooth. After carefully checking I bridged the pads with solder and I got 5V ! Of course, don&apos;t do this at home, kids. Since many models are different, the configuration might be somewhere else, see how it changed from model A to model B ! This log summarises the documents I have found about the FE-5680 family. The references lead to other resources ! You are about to report the project "Hacking a FE-5680B rubidium reference clock", please tell us the reason.